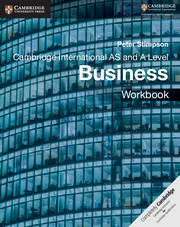 Our AS and A Level Business Workbook provides support for students studying the Cambridge AS and A Level Business (9609) syllabus. 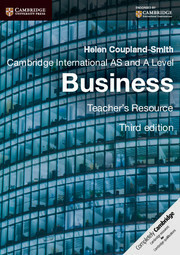 With extra questions based on the learning objectives of the coursebook, this resource helps students practise the core skills of the course. Layered questions provide step-by-step guidance when explaining how students should use application, analysis and evaluation in a business context. In addition, example answers build learners’ confidence writing long-form responses. Answers to workbook questions are available online. Practice questions improve confidence in writing long-form answers and using business terminology. Our step-by-step skills approach unpacks the syllabus requirements and highlights application, analysis, and evaluation in action. The ‘Improve your Answer’ feature provides model answers for students to build on and consolidate their learning. The ‘Research Task’ feature helps students to build their independent research skills. 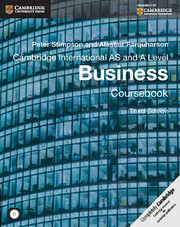 The introductory chapter defines the key skills and explains their importance for business understanding. Written by the same author as the coursebook, this resource helps strengthen the learning objectives of the course. Flexible activities make the workbook ideal for homework or in class alongside the coursebook. Answers to the workbook questions are available online.